Shoulder injury that required surgery. He was injured before Florida's opener. Smallman is up to 8 assists in 8 ECHL games after shoulder surgery. I was a bit surprised that Smallman didn't make the Checkers. He was a late round pick, but he had a pretty nice Junior Hockey Career and was a beast in the playoffs. Our head scout had a lot of good things to say about him in an interview on Hockey Prospects a couple of years ago, even comparing him to Scott Walker. I wouldn't put it past him to be the rare guy that climbs up out of the ECHL. To update the Smallman watch: Smallman has 2 goals and 9 assists in 10 ECHL games. I hope that he gets a couple of AHL games this season although he wont be eligible for their playoffs this season. He can go back to Florida for ECHL playoffs. The Florida Everblades 5-1 victory over the Jacksonville Icemen secured the Brabham Cup, which is awarded to the ECHL’s regular season champion for finishing with the best record. It marked the third time Florida has earned the regular season trophy (1999-2000 & 2008-09). ESTERO, FL – The Florida Everblades will play the Atlanta Gladiators in the first round of the 2018 Kelly Cup Playoffs in a best-of-seven series that will begin on Monday, April 16 at Germain Arena. So OBXer, is this and Checkers' playoff run an actual "ground swell" that will carry all the way up to the top level? Sure would hope that's the case. On another front, I never thought much about this, but with so much time on my hands due once again to early tee times, are there waiver requirements between ECHL and AHL? I have never seen them, but really unsure. So OBXer, is this and Checkers' playoff run an actual "ground swell" that will carry all the way up to the top level? We've officially seen it all. This is why goalies wear masks! ESTERO, FL – Mitchell Heard and Michael Kirkpatrick each posted three-point performances to lead the Florida Everblades to a 4-1 victory over the Atlanta Gladiators in Game One of the South Division Semifinals at Germain Arena Monday evening. Florida takes a 1-0 lead in the best-of-seven playoff series. im thinking about going to the Friday game. Anyone else? I did not know that. Interesting. My Dad lives part time in Fort Myers maybe get him to a home game. 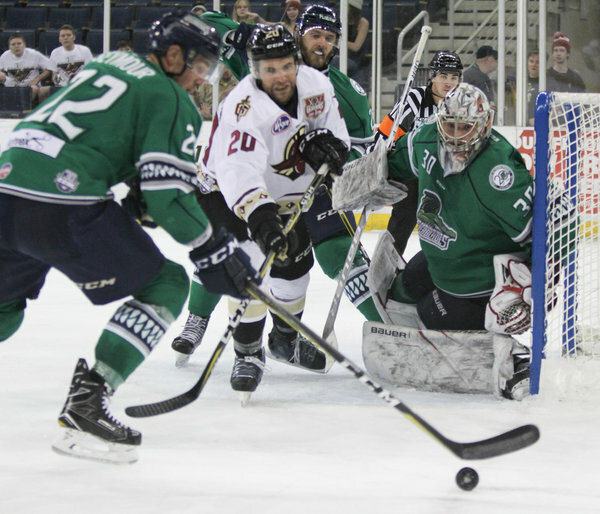 ESTERO, FL – Steven Lorentz and Michael Kirkpatrick each posted two points to lead the Florida Everblades in a tightly contested 3-2 victory over the Atlanta Gladiators in Game Two of the South Division Semifinals on Tuesday night at Germain Arena. The two teams will meet again in Game 4 on Friday at the Infinite Energy Arena at 7:35 p.m.
DULUTH, GA – Michael Kirkpatrick scored twice to lead the Florida Everblades to a 4-2 victory over the Atlanta Gladiators in Game 3 of the South Division Semifinals played at Infinite Energy Arena Thursday evening. The Everblades now take a 3-0 lead in the best-of-seven series. Callum Booth was stellar in goal stopping 22 of the 24 shots faced in the game ot earn his first professional playoff victory. At the Everblades vs Glads game. I sat at the end Atlanta shot at twice, intentionally, to see Booth in net. Ouellette is in net tonight?‍♂️. 15 SOG total through 1.5 periods. Florida gets a goal nullified and Atlanta scores a minute later.